I’ve had a lot of time to ponder Göbekli Tepe in the two years since I visited. The photos I took of the place will soon find their way to the History Channel, as it seems as if there is an embargo of sorts on photos from the site currently–or this is what I was told when negotiating the use of my photos–and producers are desperate to get their hands on something before the embargo ends and the results of this years excavations are published. 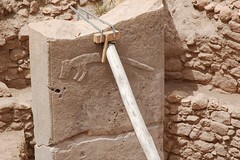 I offer these two older posts on Göbekli Tepe (here and here) before submitting this story by Charles C. Mann in National Geographic on the temple complex. The photo essay accompanying the story is here. Do read it, damned interesting. My photos of the site begin here. It is more as if the occupants of various archaeological sites were all playing with the building blocks of civilization, looking for combinations that worked. In one place agriculture may have been the foundation; in another, art and religion; and over there, population pressures or social organization and hierarchy. Eventually they all ended up in the same place. Perhaps there is no single path to civilization; instead it was arrived at by different means in different places. That feels about right to me. This entry was posted on Friday, May 20th, 2011 at 2:01 pm	and is filed under Ancients, Histories, Turkey. You can follow any responses to this entry through the RSS 2.0 feed. You can leave a response, or trackback from your own site.